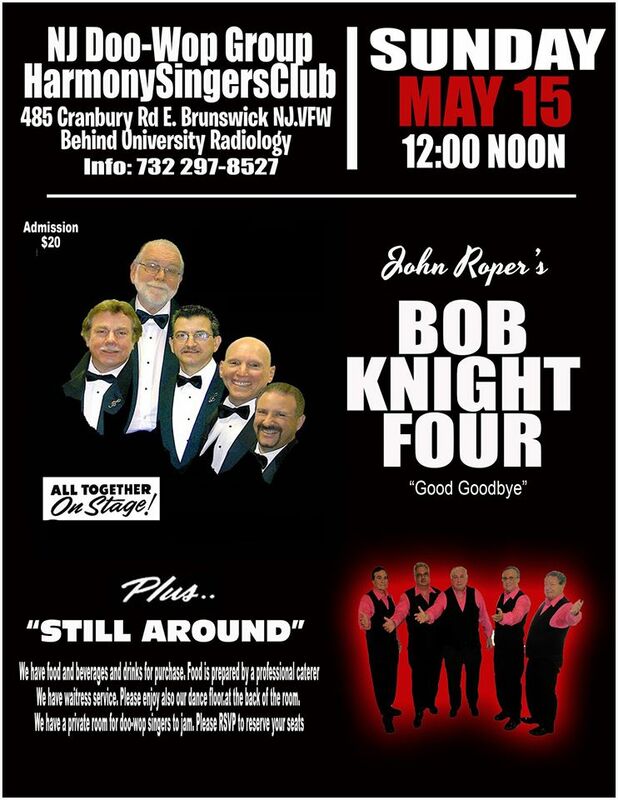 This month’s NJ Doo-Wop Group Harmony Singers Club will feature John Roper’s Bob Knight Four, plus Still Around and an assortment of surprise doo wop vocal groups. It all takes place at the VFW at 485 Cranbury Rd., East Brunswick, NJ (behind University Radiology). That’s Sunday May 15 beginning at 12:00 Noon. Food, beverages and drinks are available for purchase. The singers club is open to all who sing or enjoy doo wop harmony. Admission $20 pp ($25 per couple) at the door but please RSVP Stu Pushkin at doowopstu@hotmail.com. $20 discount for tables of eight. Complimentary coffee.